In this Lesson, you shall learn how to use the Select Case control structure in Visual Basic 2015. The Select Case control structure also involves decisions making but it slightly different from the If….ElseIf control structure . The If...Then...ElseIf statement control structure evaluates only one expression but each ElseIf statement computes different values for the expression. On the other hand, the Select Case control structure evaluates one expression for multiple values. 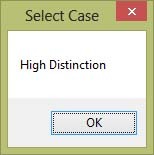 Select Case is preferred when there exist multiple conditions. 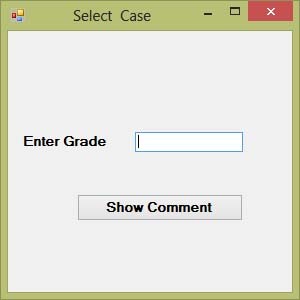 In this example, the program will display a message associated with the grade entered by the user. In this example, you can use the keyword Is together with the comparison operators to evaluate an expression.